Image: “Ray Gaddis gets position on David Accam” by Paul Rudderow is licensed under CC BY-NC 2.0. 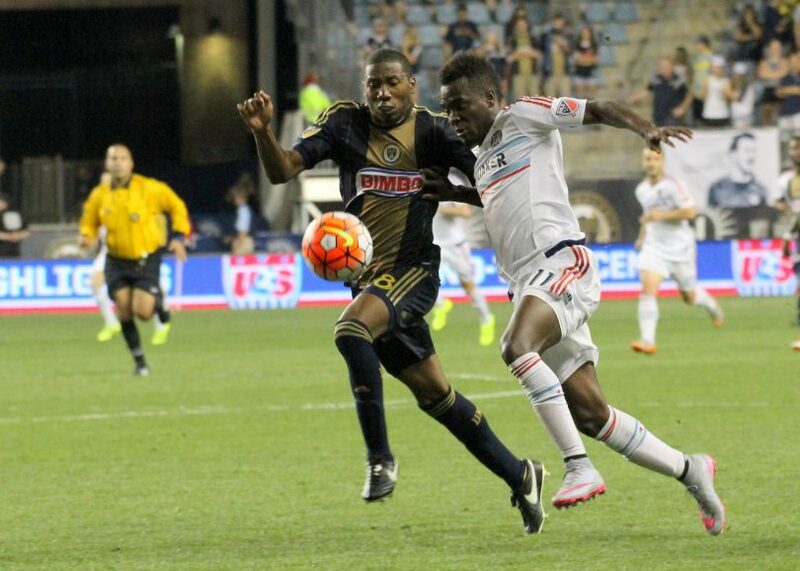 The Philadelphia Union had a dismal start to the season after losing 3-1 to Toronto F.C in the season opener at Talen Energy Stadium. Yet again, the final third on both ends of the ball could prove to be the Achilles heel this season, as a lack of scoring coupled with defensive collapses sullied the opener on Saturday. The Philadelphia Union will look to improve on their franchise-best 15 win season from 2018 when they take the pitch during the 2019 Major League Soccer campaign. Although the 2018 season saw a familiar first round exit for the Union during the MLS Playoffs, the club reached 50 points on the season for the first time in club history. It may be the eternal optimist in me speaking nonsense again, but now in 2019, the Union looks to have the capabilities to exceed expectations. If the “Boys in Blue” are to keep up with the hype surrounding the rest of the Philadelphia sports scene, their performance will be heavily dependent on what the addition of the Mexican midfielder and World Cup veteran Marco Fabian can bring to the table. Fabian is a top quality midfielder and fills in the gap left over by the departure of the 2018 MLS assists leader Boreck Dockal. While lingering back injuries plagued Fabian at his last club, Eintracht Frankfurt of the German Bundesliga, Fabian scored 70 goals during his eight years with Chivas Guadalajara. He is a true number 10 with great vision, decent speed and superb ball handling. In 2015, before Fabian arrived in Germany at the prime of his career, Tom Marshall of ESPN said, “His balance and poise on the ball is impeccable… Equally adept on either foot, he can play on either wing or as an attacking midfielder and breezes past defenders as if they are not there. Fabian also has that knack of scoring spectacular goals that help win fans over.” Considering the fact that practically every Philadelphia sports franchise has at least one major star, Fabian will need to fulfill Marshall’s prophecy this time around and use his international notoriety to increase interest in Philadelphia soccer. As they always seem to be, the offensive pieces are there for the Union. Corey Burke will return as the number one striker and for good reason after his standout 2018 campaign. Fafa Picault and David Accalm will supply the speed along the wings with backup winger Illsinho capable of filling in on either side. And the newcomer Sergio Santos will bring a welcomed offensive mindset off the bench when the team needs an extra striker. However, if Philly wants to be above average this season, their young defensive players will need to step up and play smart on a consistent basis. Center backs Jack Elliott and Austin Trusty need to be better positionally, and not leave space open in the box for rebound attempts and other easy takes on goal. Alejandro Bedoya and Haris Medunjanin acting as defensive midfielders is perhaps the strongest threat on this team. Hopefully they won’t have to pick up too much slack for the backline — that way they can contribute offensively as well. On the one hand, I want to be hopeful that this Union team can correct the problems of the past and finally move forward as a franchise. It would be great if we could see a back line that doesn’t make careless mistakes and an offense that actually plays through the midfield and isn’t so dependent on the deep ball. On the other hand, I know I’ve been conditioned to fall for the allusions on paper and be disappointed by the scoresheet. At the end of the day, this Union team is more or less the same as we’ve seen in recent years passed. Yes, they’ll be frustrating on offense. Yes, Andre Blake will make stellar saves. Yes, they’ll probably make the playoffs as a fifth or sixth seed. And yes, we’ll still wonder if Jim Curtin is the right man for the job when they bow out in the first round or lose another U.S Open Cup Final. Don’t get your hopes up Union faithful, but as always, Ad Finem Fidelis.